Pheasant feather centerpieces are a popular choice for rustic weddings and winter events, and the end of your event doesn’t have to be the end of your experience with these long, willowy and beautifully-striped feathers. We’ve discussed creative uses for ostrich feathers and ways to reuse peacock feathers, so today we have some fun ideas for using your pheasant feathers after their initial mission is completed. 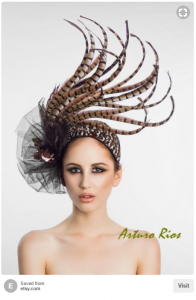 Whether dramatic or sweet, pheasant feathers lend themselves particularly well to headbands and hats. Their deep, neutral colors easily complement any outfit. And as they’re less common than ostrich or peacock feathers, you’ll stand out from the crowd. Get creative with a statement piece, and you’ll be the most noticed at your event! It doesn’t have to be a door! Wreaths can hang indoors or out, on a wall, a door or anywhere you’d like to add a little sparkle. When working with pheasant feathers, combine your feathers with leaves, branches and twine for a lovely wreath that suits any time of year. For a more sophisticated look, gold ribbon looks great up against the neutral palette. But do choose a brightly colored accent flower to draw the eye and add contrast. And position your accent pieces so you can switch them out as the seasons change. With that one simple change, you’ll have a whole new wreath! Pheasant feathers mixed with the deep, rich colors of roses, mums, craspedia and dahlias make a wonderful flower arrangement for the home or bouquet for a wedding. If you prefer brighter colors, oranges, blues and reds work. Pheasant feathers even mix beautifully with pastels—especially pinks. While creative alternatives are great, sometimes the simplest solution is best. There’s no reason to not preserve and reuse your centerpieces in their original form. Although we see them often at weddings, pheasant feather centerpieces are also ideally suited for even the most casual of dinner parties. 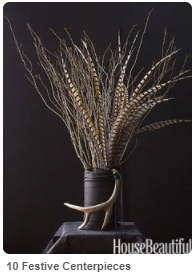 Pheasant feathers are as versatile as they are lovely. Stretch your imagination, and you’ll find no end of ways to make use of these timeless and tasteful touches of décor!